When you go from racing in your local 10-boat fleet to a 50-boat regatta, life on the racecourse changes. In a small fleet, if you make a mistake, it’s possible to tack away, find clear air, get some leverage, and get back in the game. In a larger fleet, or on a small racecourse, there’s less elbowroom and mistakes are amplified—especially at the start and at mark roundings. So before you head out to your next big event, commit to memory the following high-risk tactical moves that always seem as though they’ll work, but actually have a low probability of paying off. 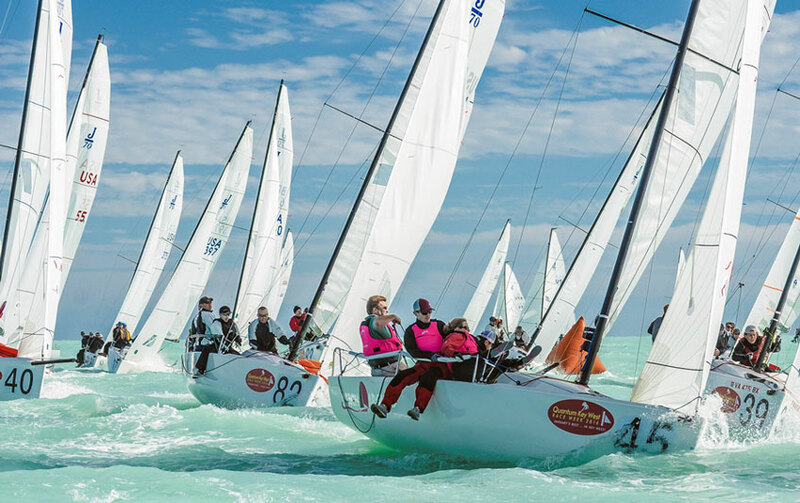 Big Fleet Sailing - J/70s race at the 2016 Quantum Key West Race Week. Photo by Sara Proctor. What do you do when you’re sailing down the line on starboard tack with 2 minutes to go, unable to jibe through the wall of port tackers returning to find a hole? You’ll often see people wait to jibe until they reach the end of the port-tack train. The last starboard-tack boat to jibe is the caboose, and being the caboose is like being the last guy into the supermarket parking lot, unable to find a spot. On the starting line, all the holes will be taken. If the line of returning port-tack boats is too thick to jibe into, head upwind a boatlength or two and either jibe or tack. Getting back into the port-tack parade sooner will increase your odds of finding a hole on the line. 2. Sailing down the line on port tack and putting your bow to leeward of the boat in front of you. How many times have you had your bow pinned to leeward of a boat in front of you, so close that you’re unable to tack into a great hole that opens up? When you’re stuck to leeward you have to wait until the weather boat takes the next good hole that comes along, leaving you waiting for table scraps. Instead of getting stuck, slow your boat by easing the sails or by making large S-turns so that your bow is directly behind the weather boat’s transom. This will give you the freedom to move as you like and get the hole that you want. 3. Sailing up the middle of the course when the wind is light and the puffs are significant. If the wind is puffy, and the puffs are moving quickly, you can defend from the middle when people from the edges are coming across with pressure. Unfortunately, when the puffs are moving slowly, or in lighter air when the pressure differences are often great (such as Biscayne Bay or Tampa Bay), the edges of the racecourse can be better. When the puffs are moving slowly, and you’re on the edge of the fleet, you can be patient and wait for the extra pressure and use that pressure to tack and cross those in the middle of the course. The only option for boats in the middle is to tack in order to maintain leverage, but they’re losing all the time because you’ll likely be sailing over the top of them with better speed. 4. Always demanding your starboard rights. You’re on starboard, on a lift, or, for some reason, you’re determined to get to the left side of the racecourse and a port tacker is coming. How many times have you gotten worked up and felt as though you had to enforce your rights by yelling, "Starboard!" as loud as you could, only to have your rival tack on your lee bow so perfectly that you’re forced to tack away? Once you tack, you’re on a header, probably sailing to less pressure and away from the best side of the racecourse. In a situation such as this it’s usually better to let the port tacker cross. If you want to get left, wave them by. Tell them they owe you one and sail for the good wind or current. It may feel strange to let them off the hook so easily, but when they cross and later tack to weather and behind, you’ll feel better about letting them go. 5. Tacking away from the layline for clear air. You’re on port tack, sailing towards the starboard-tack layline as you near the weather mark, and someone tacks right on your nose. It’s tempting to throw the boat into an immediate clearing tack, but before you fall victim to the knee-jerk reaction of tacking away for clear air, consider whether it’s better to live in the bad air or foot off until you reach the starboard layline. If you’re really close to layline, the odds are that the wind on the other tack (underneath all the boats on the layline)will not be any better. Tacking away will require you to do three extra tacks. In a bigger boat, or in light and lumpy conditions, three tacks in short order could be deadly. 6. Tacking shy of the starboard layline. Sometimes, as you reach the starboard layline, it looks as though you can tack just shy of the layline and to leeward of a pack of boats, pull off a perfect luff, and actually make the mark. I’m not sure why this always looks so good, but inevitably it turns out badly (except in the rare circumstance when the boat in front of you actually hooks the mark and drags it to leeward four lengths, allowing you to get around.) It’s usually much better to go with the conservative duck of boats that are on layline and find a spot where you’re slightly overstood. Approaching the mark on starboard tack, slightly above the fray, will allow you to close-reach over boats luffing to get around the mark, and let you watch the entertainment. 7. Jibing right on the team in front of you when they jibe early on the run. This is usually a sound tactic, but before you go attacking, make sure to look over your transom to see if your competitor is suckering you to jibe into the bad air of the fleet behind, which has already jibed. If the boat in front of you is certain that you’ll jibe on him, it may lure you into jibing and then immediately jibe back into clean air, only to laugh at you as they sail away. 8. Taking the low road when everyone else is going high. Immediately after rounding the weather mark, you sail your normal course and realize everyone else is sailing hotter angles. You tell yourself that they’re sailing away from the mark, and it seems it would be better to go low. So you work low, underneath the dark cloud of disturbed air from the fleet rounding the mark, only to find that the whole fleet is now rolling you. If you jibe, the situation is just as hopeless, and things look grim. Where should you go? If the seas are flat and the waves are not surfable it’s usually better to stay high and keep your air clean. Staying high with clean air (outside or on the edge of the weather mark Bermuda Triangle) allows everyone else to make the mistake of sailing in the disturbed air zone while you sail in clean air and go fast. When the waves are more powerful than the wind, you may find that going low and catching a wave or two may get you low enough to get separation from the fleet. 9. Not keeping your nose clean on the reach. If there’s a boat close to your bow and a boat behind that’s tempting you into a luffing matching, be careful that the boat behind doesn’t take you up to a point where your bow becomes hooked to windward of the boat in front of you. When this happens the boat in front of you will probably react by luffing you to the moon. If the boat behind succeeds in initiating the luff, and getting you and the boat in front of you to take each other out of the race, he may quietly sail below the two of you and pass you to leeward. The best way to control this situation is to luff, but control your speed in order to keep your bow clean and have the ability to turn down. 10. Not thinking about windshadows on the run. How many times have you thought about jibing back to the middle of the racecourse in order to reconnect with the fleet, only to let the fleet behind you jibe first. You jibe late, only to find that you’re in the entire fleet’s bad air. Your other option was to keep going well past layline so that you could jibe and reach back to the leeward mark in clean air. It’s important to know exactly where your opponent’s windshadow falls. Practice sailing in someone’s bad air to figure this out. Then, the next time you need to jibe into a narrow lane, you’ll be able to live there.